MultitrackStudio is a virtual multitrack studio. You can record and play audio and MIDI tracks, edit them, and mixdown to stereo. The straightforward and uncluttered user-interface has been designed with tape-based recording in mind. Mixer sections are oriented horizontally (as opposed to the more familiar vertical layout), allowing them to include an editor as well. The editing tools are aimed at correcting mistakes. MIDI tracks have been made to look like audio tracks as much as possible. The large number of high quality effects and the built-in General MIDI compatible MultitrackStudio Instruments make it possible to do software-only mixing and mastering. All track, mixer and effect settings can be stored in a song file and recalled any time. Using a songlist you can play a sequence of songs. This way you can preview your CD project without having to mix the individual songs down to stereo files first. Audio (mono or stereo) and/or MIDI tracks. 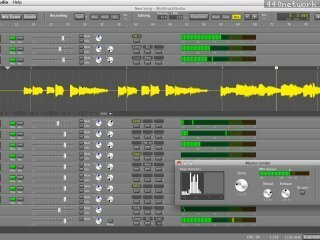 Cycle recording: record multiple takes automatically. VariSpeed: change pitch of the song to match your instrument (Pro Plus edition only). Record alternate takes with just one key press. Unlimited number of groups and effect send/returns supported. Route Group or Effect Return sections to soundcard outputs (Pro Plus edition only). Mixer / Effects automation (Pro Plus edition only). Use Song Versions to store/recall mixes. Choose out of 19 high quality audio effects (more). Use VST and DX plugins. Powerful effect sidechaining options (Pro Plus edition only). MultitrackStudio Instruments (General MIDI sounds). Disk-streaming Sampler (reads .GIG, .SF2 and .SFZ patches). Supports third party VSTi and DXi plugins. Use external synths and/or your soundcard's synth. MIDI pianoroll, notation, drum and controller editors. Manipulate knobs etc. directly without finding your mouse and locating the pointer first. Full touchscreen support, no mouse or keyboard required. Windows 7 multi-touch supported (most notably in the onscreen MIDI keyboard). Also works well with Windows Vista/Xp/2000 (single touch). Wizard to perform basic tasks. Context sensitive help system: point the mouse and press the F1 key. Windows 8, 7, Vista or XP. Windows 10: audio playback device can be used in 'shared mode', so other programs can use it while MultitrackStudio is running. Windows 7 and newer: .m4a files are now supported (you can open them and export to .m4a). Windows 7 and newer: existing aac/ac3/mp4/wma files can be used. Mac: can now save to .m4a 'everywhere' (rather than just in the Mix Down window). Mac: added 'lossless' to the list of .m4a file qualities. This creates a 16 bits Apple Lossless ('ALAC') file. Windows 8 and newer: An mp3 encoder is no longer required in order to export to mp3. Native support for PreSonus FaderPort remote control. VST plugin folder(s) can be rescanned by pressing F5 (Windows) / Cmd+R (Mac) in effect/instrument selector. Touchscreen (Windows): Redesigned editor user interface: The mode buttons have been removed. A selector now appears on touching an editor, and you can pick an action by moving your finger in that direction. Editors can now be scrolled at any time without having to worry about the mode buttons. MIDI and automation editors now always use 'handles' to move notes/dots. MultitrackStudio Remote and 'Web Browser' remote controls can now handle more than 128 mixer sections. Automated Fader / automation editors / MIDI controller editors: dots are easier to grab with the mouse. Remote Control Device window: MIDI device selector dropdowns now update if you (un)plug the device. Windows: 'Select Devices' window: MIDI device selector dropdowns and WASAPI audio device selector dropdowns now update if you (un)plug the device. Time signature can now be edited while transport is running (unless there are recording MIDI tracks). Mac: Comment, Lyrics, Chords windows and Lyrics prompter can be zoomed using two finger pinch gesture on trackpad. Various editor improvements (both visible and invisible). Automated Fader / automation editors / MIDI controller editors: value next to dots didn't always appear correctly. Mac: "Mix down to audio file" can now create 48 kHz .m4a files (it always created 44.1 kHz files). Convolutor / Guitar Amp: very short IR files didn't work right. Mac: got rid of "is from an unidentified developer" message recent macOS versions showed on launching MultitrackStudio for the first time. Some VST plugins would cause an access violation while processing audio. Some VST plugins would crash immediately on loading the plugin. Resizing VST plugin window didn't work properly if plugin UI had very small height initially. Monitoring the 'Internal' sidechain input on a VST plugin could result in silence. Also applies to AU plugins on Mac. Mac: user interface of some VST plugins was not visible (window very small). Mac: some multiple-output AUi plugins didn't have output mixer. Mac: some AU plugins turned stereo signal into mono. Mac: unloading certain AU plugins no longer leads to MTS crashing and terminating. Audio track input selector now has 'Practice Mode tracks' option. Tempo editor: "Conduct" (tap new tempo for selected part). You can tap an accelerando for example. Tempo editor: Ctrl key can be used to create a gradual tempo change (accelerando/decelerando) while moving the righthand side of the selected part. Touchscreen (Windows): Tempo Editor SEL menu features 'Stretch' and 'Stretch Accelerando' options. After picking one you can resize the righthand side of the selected part. The accelerando version creates a gradual tempo change. Tempo editor now updates live while stretching or warping selected part. Tempo / Time Signature editor buttons (Undo etc.) can be controlled using keyboard shortcuts. There's a dot on the left that indicates which of the two editors is has keyboard focus (similar to tracks). Punch recording with External MIDI Instruments: existing signal is now audible, just like it is with audio tracks and software instruments. Tempo editor: Undoing a "tweakable edit" now undoes the last tweak only, rather than all tweaks. All other editors work this way already. Tempo / Time Signature editor: lesser used buttons (Cut, Copy, Paste, Repeat etc.) are now in new 'More' menu. 'Add Click Track': BPM value is no longer limited to whole numbers. OS X: 'Tap tempo' boxes are more accurate. Guitar Amp effect now features 3 stompbox effects. Each can contain Auto Wah, Booster, Chorus, Compressor, Delay, Echo, Flanger, Noise Gate, Phaser, Pickup EQ, Reverb or Tremolo. Comes with 40 presets by Christian C. Thompson. Guitar Amp now allows for loading your own speaker impulse response file. Convolutor effect now has Random button to make reverbs sound smoother. Windows: more VST DPI scaling options. The "Auto (VST, ugly)" UI size is replaced with "VST Scaling (ugly)" option. This can be used with any size setting, not just "auto". Edit menu now features several options for opening Multi MIDI Editor: you can show all MIDI tracks of a certain color, all MIDI tracks which have their editor open or all MIDI tracks. Time Signature editor: Time Signature picker now allows for quickly picking any of the song's time signatures without having to type it. Noisegate effect: the Reduction knob now has immediate effect on sound, even if the gate was closed already. Touchscreen (Windows): the 'Vertical' knob mode now responds to vertical movements exclusively. Includes over 160 effect presets by Christian C. Thompson. Onscreen keyboard: the volume slider can now be assigned to any controller (including pitch bend and note velocity). Touchscreen (Windows): rotary knobs can now optionally be controlled using vertical movements. See the 'Allow vertical' box in the Preferences pane. Windows: added 250% and 300% values to UI Size box in Preferences window. These options are intended for the Microsoft Surface Pro 4. Mac: CPU Usage indicator now shows total CPU usage rather than just MultitrackStudio. Touchscreen (Windows): the onscreen keyboard Drum layout pads sound a bit louder in the top-right corner, allowing for more expression. The Bass, Snare and Side pads sound a bit louder in the top-left corner because they are typically played using the left hand. Mac: some VST plugins were only partially visible. Song time signature/key signature info could change under some circumstances when importing a MIDI file. Touchscreen (Windows): pianoroll, drum and score editors now optionally feature handles for manipulating selected notes. The handles appear at the bottom and right hand side of the editor. There's a "Handles for MIDI notes" option in the Preferences pane. AU, VST and External MIDI instruments no longer solely rely on 'all notes off' MIDI messages to mute pending notes. Exception errors while saving song are handled better to avoid data loss. Most text was missing from the user interface under OS X 10.11 (El Capitan). Multi Column Rack: VST/AU automation windows could appear outside of the screen (Pro edition). Support for Microsoft Surface Pro 3: new 'Pen with touch scrolling' mode. This mode works with pen exclusively, so you can't tap something accidentally with the hand palm. You can still scroll editors and lists with touch. A button is available for switching between pen and touch mode quickly. Windows: Added '200 %' and '240 %' values to Size box in Preferences window, so the UI can be scaled large enough on high-DPI screens like the Surface Pro's. Also added 'Auto (VST, ugly)' option which makes the program not dpi-aware so Windows scales the UI (including VST plugins) in a blurry way. Touchscreen (Windows): semi-transparent 'Rewind' / 'To last start' hints appear on touching the transport counter box. Touchscreen (Windows): Time stretching in track editors. Touchscreen (Windows): Onscreen MIDI keyboard can be zoomed horizontally using two fingers on the bar at the top. Touchscreen (Windows): pianoroll, score and audio editors can be zoomed vertically using two fingers on the editor itself (requires Windows 8 or newer). Touchscreen (Windows): pianoroll: selected notes which are long enough get resize grip to move start of note (in addition to the one at the end of the note). Touchscreen (Windows): "Sticky add/draw modes (touch)" option in Preferences window. Improved transport cycling: overview bar remembers cycle region after transport stopped, transport menu features 'Set Cycle Start' and 'Set Cycle End' options which can also be invoked with the F7/F8 keys. Cycling can be started by clicking the start button while pressing the C key, or by pressing C+Space. With touchscreen (Windows) or pen you can press-and-hold the start button. "Section Practice Mode" and "Set Cycle Start" Remote Control actions. Punch-in recording: transport now automatically starts at least one bar before punch-in point (2 seconds if editor timescale isn't set to bars). MultitrackStudio Instruments: use up/down arrow keys to step through instruments. With touchscreen (Windows) you can swipe up or down over the instrument box. Also works with the SoundFont Player presets (OS X). MP3 importing: file samplerate will now be converted if it doesn't match the song's. MIDI editors: tweaked graphics to make it easier to see which mode the editor is in. Issue with sending volume controllers (#7) to External MIDI Instruments. Mac: SoundFont Player ignored note-offs with certain soundfonts. You'll have to re-import these soundfonts. Mac: SoundFont Player ignored pitch bend range setting. Matrix Sampler's Volume knob settings weren't stored and recalled correctly. Pitch bend range messages are no longer being sent to Garritan 'CFX Concert Grand' VSTi (it conflicts with the plugin's stretch tuning controller #100). Touchscreen (Windows): playing legato on the Chords onscreen keyboard was difficult. Names changed: 'Pro Plus' edition is now called 'Pro', 'Professional' edition is now called 'Standard'. Standard edition now contains the Guitar Amp effect and it can open existing 24/32 bits audio files. It comes without the Multitrack Editor. Multiband Compressor effect (Pro edition only). MultitrackStudio Instruments: virtually all instruments sound better. Acoustic pianos respond to Soft pedal (controller #67). Bowed strings and many winds respond the Legato controller (#68). Synths have Filter and Resonance knobs (and no longer use EQ effects for filtering). Drums have Bass/Snare/Toms/Hihat/Ride/Crash level knobs. MIDI editors: added 'swing' options to quantize resolution box. Importing MIDI files: files can optionally be adjusted to song tempo. Mixer sections can be moved vertically using trackpad/mousewheel 'anywhere' (no need to use the scroll bar). Tracks can be switched to Practice Mode by doubleclicking the track's Play button. Tracks can now be in Practice Mode regardless of instrument or effect windows being visible. Having multiple tracks in practice mode simultaneously is now possible. Soft-monitored audio tracks: level meter shows speaker symbol to indicate output clipping (the meter itself shows the input level). Importing audio/MIDI files: files are now copied to song folder. A track's 'Open' option still opens file without copying. 'Import Audio/MIDI file' dialog now remembers folder. New songs automatically have a Reverb effect in the first Effect Return section. Presets can be imported/exported (see Preferences window). Mac: 'Mix down to audio file' can now create .m4a file. Tempo editor: BPM lower limit lowered to 8 BPM, so there's more room for fermata. External MIDI Instruments: controllers are now being sent right from the start (it used to wait until a note was played). Mac: copying effect slot from track to Edit Control window wasn't possible. Windows: fixed possible crash after disconnecting audio device (using 'Windows' audio driver type). Stereo Imager wouldn't convert stereo input to pure mono (Width=0 didn't work). The Mac version has been updated to get rid of the ""MultitrackStudio can't be opened because it is from an unidentified developer." message which OS X Yosemite presented when trying to run MultitrackStudio for the first time. Mac: Updated graphics to match OS X Yosemite. Mac: Some SoundFont Player issues are fixed. Windows: Improved LAME MP3 encoder compatibility. Windows: Fixed issue with playback /recording level controls using Windows audio driver type. Sampler: Improved sf2 file compatibility. Audio track input selector: level meters work smoother with some audio devices. New 'Matrix' and 'Chords' onscreen keyboards. Audio input level fader appears at top of the main window when it's needed (if the audio device supports level control). The Audio Input Control window has been removed along with the 'Automatically assign channels to tracks' option. MIDI tracks using External MIDI Instruments now support automation of volume fader/pan knob (works for playback only). (Pro Plus edition). Enable Mixer button is removed from Song Properties window. Any existing songs using this will be converted automatically. Track audio input selector shows level meters even if Rec button isn't engaged. These meters don't appear in the Lite edition. Audio track can now be in practice mode even while other tracks are recording audio. Audio devices can have up to 140 channels now (was 96). Mac: editors scroll smoother with trackpad. Mac: improved .aif file compatibility. Improved LAME MP3 encoder compatibility. Pseudo Stereo effect is renamed to Stereo Imager, and now processes stereo input signals as well. Compressor, Dynamics, Phaser and Saturator effects no longer use a lot of CPU power while automated knobs are moving (Pro Plus edition). Convolutor effect: Volume knob can now be automated (Pro Plus edition). Echo effect: Mix knob now controls input of echo loop rather than output. This makes things like adding echoes to certain words only easier (using Automation). "Expand to Chord" menu plays the chord before clicking it. Onscreen keyboard's Keyboard layout has another octave of keyboard shortcuts. Audio editors could flicker while scrolling backwards. Exception error on trying to export empty song as .zip file. Windows: grid bar (above editors) didn't show cycle region if no markers were present. Recording the master output to an audio track and the 'Mix down to audio file' feature didn't work if there were only MIDI tracks and no audio tracks. Performance improvements in Guitar Amp (Pro Plus edition), Master Limiter, and EQ effects. MIDI input/output devices: tighter timing. A couple of bugs have been fixed. Show all effects in a mixer section simultaneously (keep 'M' key down while clicking slot). Mac: SoundFont Player (requires OS X 10.7 or newer). "Mix Down to Audio File" window: Channels box defaults to Mono if Master section's Mono button a engaged. MIDI controller / automation editor selector list items have subtle green dot if the editor contains any dots. Renamed Windows audio driver terms: Driverset, AsioSnd, VistaSound and WinSound are now 'Audio driver type', 'ASIO', 'Windows' and 'Windows XP'. Windows: MIDI / Control Surface devices settings no longer change if you change audio driver type. Mac: Select Devices window detects USB audio/MIDI devices which are plugged in/out. MultitrackStudio Instruments: some sound improvements. Song editor: gridsnap now also works while there are no MIDI tracks. Mac: MTC sync code wasn't sent correctly. Mixer sections can optionally have 6 effect slots instead of 3. Half solo: doubleclick a solo button to dim other tracks. VST/AU output mixer has level meters. VST/AU output mixer supports multiple solo and half solo. Sampler supports Modulation controller (#1). VSTi plugins: drum editor can use text file with instrument names. VST/AU effect midi out data can be recorded to MIDI track. Level meter of recording audio track shows peak level since transport start (dimmed segment). Mac version takes advantage of Retina displays. Practice Mode now works with speed-only VariSpeed mode (Pro Plus edition). Support for Mackie Control and HUI control surface level meters and transport counter. Compatible with OS X 10.9 (Mavericks) and Windows 8.1. Improved pen (stylus) support: easier scrolling and optional onscreen keyboards. 'Open same color MIDI tracks in Multi MIDI Editor' no longer opens track editors. Multi Midi Editor: redesigned track buttons, leaves a bit more space for editor. Multi Midi Editor remembers whether user wants it to cover the overview bar. Overview Bar now always shows all markers, even if it's passed the end of the song. Patchmap files can be unicode, so they can contain Asian characters etc. (Windows) Improved MIDI recording timing accuracy. MP3 'very high quality' could actually be 'high quality'. Mac: several more bug fixes. 'To Song (Hi)' control surface action to make 'To Song' work with more than 128 songs. Automation Editor (Pro Plus) and Automated Fader windows can be resized vertically. Score editor has 'Split in equal parts' option, just like pianoroll. 'Size' setting in Preferences window to scale user interface independently from Windows DPI setting (Windows). Better DPI scaling for DPI value just above 96 (Windows). Tempo editor: tempo line is now updated while moving it vertically. Editor Edit/Delete and Undo/Redo buttons have been swapped. Score editor: '1'..'6' and dot buttons are replaced with a single dropdown list next to the '+' button. Score/pianoroll editor: 'Merge Notes', 'Expand to Chord' and 'Split in equal parts' now appear in 'More...' button list. Drag-and-drop: an image is visible while dragging an effect slot or mixer section etc. Pianoroll editor allowed for making note duration zero. This could cause problems, especially with cycling playback. Gapless cycling: VSTi plugins which use transport information (Jamstix etc.) wouldn't cycle. Unmuting a stereo track which contains an Echo effect could cause crash. Audio track editing: crash when editing a new file, clicking undo, starting transport and then clicking redo. Songs having exactly one group section wouldn't open correctly (Lite and Professional edition). Score editor: issue with adding notes using the '1'..'5' mouse modifier keys. Transport cycling: stereo audio files could cause program crash. Cycle recording: after a couple of cycles the Overview Bar no longer showed part after cycle region. 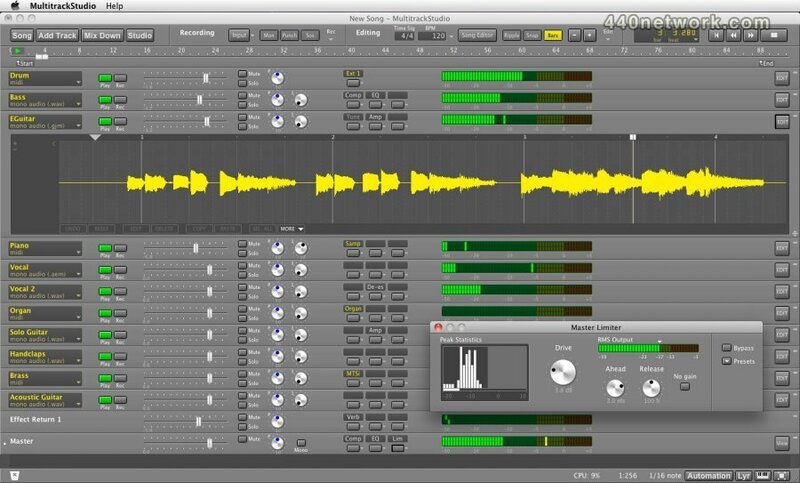 Drum editor: Redo could cause exception error in certain situations. Song Properties-->Clean Up: deleting a .aem file could in rare cases cause crash when editing this track again. Control Surface: track Play/Rec buttons could be toggled when this shouldn't be possible. Touchscreen support, which was introduced three years ago, has been improved and modernized. The user interface can now scale down to a smaller size if screen estate is limited, so MultitrackStudio can run comfortably on the new 10-inch Windows 8 tablets several manufacturers have announced. In order to utilize all the space provided by a large monitor there can now optionally be multiple columns of mixer sections. There's a "Multi Column Rack" setting in the Preferences window. This new feature can be used for multi-monitor setups as well. In this case track width is automatically adjusted to fit a monitor. Multi monitor support has been improved by making sure secondary windows don't appear "on the fold". On Windows full screen mode now fills all monitors which where covered by the main window. The transport can now cycle "gapless", there's no longer a small piece of silence when it jumps back. Immediately click the thumb again, but this time keep the mouse button down. Now move the thumb to the point where you want the cycle to end. Note that this click-and-drag action is a variation on a doubleclick, which starts the transport without cycling. Click-and-drag works on the editor needle thumbs as well, so you can quickly cycle the part you're interested in. Automation editors (Pro Plus edition), Automated Fader effect and Vocal Tuner key editor can now be used while the transport is running. Transport position indicator and overview bar now show bars automatically if there are any MIDI tracks (can be switched off in Preferences window). When you start cycling using the overview bar it snaps to bars automatically, so it's easy to cycle a couple of bars. If any chords or lyrics are available a Lyr button appears near the bottom right corner of the main window. Clicking this button shows the new lyrics prompter. The lyrics prompter scrolls automatically if the transport is running, so it can be used to read the lyrics/chords while recording. Clicking a bar will move the transport position to this bar. Doubleclicking a bar will pop up the chords or lyrics editor and select that bar. The font size depends on the size of the lyrics prompter panel: if you make the panel taller the font will get taller as well. Score editor supports transposing instruments (Bb clarinets etc.). "Ultra Dark" color theme. On Windows the Light theme is replaced with a new High Contrast theme. "To Song" control surface action, intended for playing backing tracks during live shows. "Start Playback" and "Start Recording" control surface actions. "Full Screen" button in bottom right corner (not on Mac OS X 10.7 or newer). Improved VST/AU plugin compatibility (Melodyne). Various user interface improvements (redesigned transport counter and group selectors etc.). BPM tappers are now embedded in windows like Add Click Track, so you don't have to click the Tap button first. A Control Surface can now have up to 64 channels (was 8). Narrow vertical strips next to the mixer sections are removed, this makes the vertical scrollbar easier to use. The Clip Shelf can now be made visible using the Studio menu. Editor and transport units (bars or seconds) are now stored in song files. Removed "Large Meters" setting from Preferences window. Meters now become large automatically if there's room for them. EQ effect: 1/3 octave and critical bands spectra now show vertical bars rather than lines. (Windows) VST plugin causing exception error will automatically run bridged next time. Resource leak which could cause crash after running MultitrackStudio for a long time. The new Vocal Tuner effect corrects out-of-tune vocals. It features two programs: Natural, which corrects pitch in a very unobtrusive manner, and Modern, which sounds a bit synthetic and robot-like. The key editor shows both the input pitch (dimmed color) and the output pitch (bright color). Pitch is quantized to the closest key. Using the key editor you can turn keys off for certain parts. If a key is off pitch is quantized to the closest key which is on. The VariSpeed controls have been redesigned. VariSpeed can be now adjusted while transport is running (but not while recording). There's a new "Speed Only" VariSpeed mode which changes speed 50..150% without changing pitch. This can be used for practicing etc. "Speed Only" mode doesn't work while recording. Effects in Group/Effect Return/Master sections can use tracks and group busses as sidechain source. Track sidechains can now be stereo. VSTi/AUi with multiple outputs: Up to 30 outputs can now be sidechain source (was 15). The "Mix down to audio file" window can now optionally remember the destination folder. Any channel count and/or bit depth options now appear in the window itself (new windows used to pop up for this). Can drag effects from mixer sections to track editor's Audio Edit Control. Grid bars (above editors): double clicking thumb starts transport, clicking anywhere on grid bar stops it. Overview Bar: double clicking thumb starts transport, clicking thumb again stops it. "Record Master" is no longer limited to two audio channels (Pro Plus edition). "To Next Song" control surface action added. Faders and rotary knobs let you type value after Ctrl+click (Windows) / Cmd-click (Mac). Clean Up tool (Song Properties window) now lists unused alternate/partial takes as well. Effect/Instrument selectors show format (VST/AU/DX) if the effect is available in multiple formats. EQ spectrum display updates faster. Averaged "Output" or "Master Out" spectrum reflects changes immediately after turning knobs. (Mac) Some AU instruments, like step sequencers, couldn't sync their transport to MultitrackStudio transport. (Mac) EQ spectrum display graphics issue. Changing fade type in multitrack editor caused error. Some exception errors caused more problems than necessary. Some VST plugins would crash if song recorded in Mac version was opened in Windows version or vice versa. Error if Outputs setting in Song Properties window exceeded 48 (Pro Plus edition). "Show tooltips" setting was always on again after restarting the program. (Windows) Fixed 'Cannot focus a disabled or invisible window' error. (Windows) The settings file sometimes couldn't be written to. (Windows) VistaSound driverset better handles unplugging USB audio devices. (Windows 64 bit) Error if Compressor's Ratio and Knee knobs were turned up all the way (vintage programs). (Mac) Outputs of AU Instrument having multiple outputs couldn't be used as sidechain sources (Pro Plus edition). (Mac) Error occured if audio recording and playback devices didn't have any supported samplerates in common. (Mac) Control Surface Settings window "Info" button didn't work with most presets. (Mac) Numerical keypad Enter key didn't work. A couple of other fixes. MultitrackStudio is now available for Mac as well. The Mac version works with OS X 10.7 (Lion) and 10.6 (Snow Leopard). VST plugins can't be "bridged", only 32 bit plugins are supported. Can open existing .aac, .ac3, .aifc, .caf, .mp4, .m4a, .snd, .au and .sd2 files. Songs recorded with the Windows version can be used in the Mac version and vice versa. The Windows versions have been updated as well. Onscreen MIDI keyboard now works while MIDI Keyboard Splitter window is visible. Mousewheel on small strips on left/right side now scrolls mixer sections vertically. "Bridged" VST plugins received incorrect tempo information. Master Limiter's RMS meter didn't work at 192 kHz samplerate. Audio and MIDI tracks can now be edited while they're playing back. Web Browser control surfaces (use phone or tablet as simple remote control via WIFI). Tracks can be routed to audio device channels directly, just like Groups and Effect Returns (Pro Plus edition). Pianoroll editor can now change duration of multiple notes simultaneously. Patchmap files can now specify 'initialization sysex'. Control surfaces: new ToSection and ToMarker actions. VistaSound (Windows) and CoreSound (Mac) driversets: Audio Input/Output Control windows now have level fader if the audio device supports this. Audio Input Control windows and track input channel selectors have per-channel level meters if at least one audio track rec button is engaged. Windows 8 tablet support: several improvements. Most notably score editors can zoom vertically, and track editors open 'full size' when running on a small screen. Chords editor improvements: automatic capitalization, can type '\' instead of '|', unrecognized chords underlined in red, now supports '|C F|' instead of '|C - C - F - F|'. Chord track (generated from chords) improvements: user programmable patterns, several styles, tracks update automatically if chords change. Chords/Lyrics editors: type Tab/Shift+Tab to go to next/previous bar. MultitrackStudio Instruments: acoustic pianos sound better, and sustain pedal sympathetic resonance is more realistic. (Mac) Custom patchmap files can now be placed in the user's Library/Application Support/MultitrackStudio/PatchMaps folder. Edited audio track files can be saved to file with original file name (for example: Piano.aem can be saved as Piano.wav). MIDI instrument selectors now show actual device names for external instruments rather than just 'External MIDI Instrument 1'. (Mac) Editors can zoom (using trackpad) while transport is running. (Windows) AsioSnd driverset: audio input channel assignments can be changed while recording. Audio Input/Output Control windows (except for AsioSnd Audio Output Control): changes are effected immediately (no need to click OK). Added keyboard shortcuts for transport cycling: Ctrl+F7 (Windows)/Command-F7 (Mac) sets cycle end marker, F7 starts cycling to cycle end marker. MP3 tag editor is now embedded in track file properties window. Pianoroll/Score/Drum editors can copy/past single notes. Song Editor didn't properly update display if there where no MIDI tracks. Fader and Pan tooltips could show wrong value after undoing automation (Pro Plus edition). Some VSTi plugins (Machine II) wouldn't work 'bridged'. There were ways to import an audio file without seeing samplerate conversion options dialog. A 64-bit version is now available. The 64-bit version can utilize all the computer's memory, which is important if you use many large sample-based VSTi plugins. From now on new releases will appear as both 32 and 64 bit versions. Works with 64-bit Windows 7 / Vista. 32 and 64-bit versions can be installed side by side. Supports 32 and 64-bit VST/VSTi plugins. 32-bit MultitrackStudio supports 64-bit plugins as well if you're on 64-bit Windows. The default VST folder is still "C:\Program Files (x86)\MtStudio\VSTplugins\". After changing the VST folder in the Preferences window you'll be asked for permission to run "MtStudio.exe" as Administrator. That's to update the default VST folder in the registry, so plugin installers can find it. Unlike 32-bit programs, 64-bit programs aren't allowed to do that without administrator rights. Does not support DX/DXi plugins. Expects lame_enc64.dll MP3 encoder (as opposed to lame_enc.dll for 32-bit version). Until now imported sampler patches were stored in the "C:\Program Files (x86)\MtStudio\Patches\" folder by default. 64-bit programs are not allowed to write to that folder, so this had to change. It now uses "C:\Users\username\AppData\Roaming\MtStudio\Sampler Patches" by default for new installs. Create a folder with a more convenient name, like "C:\MTS Sampler Patches". Pick this folder in the Studio menu's Preferences window. Copy the contents of "C:\Program Files (x86)\MtStudio\Patches\" to the new folder. You can skip this step if you never imported any sampler patches. The Master Limiter now features an RMS output level meter, which makes it easier to mix all your songs to the same level. The latest version of the Dirac Pro pitch shifting / time stretching technology is used, which is twice as fast as the previous version. Pianoroll: more vertical zoom levels. The "Insert" button is now called "Ripple". Easier error reporting: "Send Now" sends the report over the internet without requiring an email program like Outlook.